how did you do it? it`s great, very nice, I'm happy follow your blog!! Wow Jody, wat een schitterend bankje, de stijl, de stof en ook de leuke pootjes. Jody! It`s beautiful. I liked that there are two fabrics. I LOVE the fabric choices and the bench is incredible!! wat een mooi bankje Jody! en wat een mooie stof met die roosjes in zachte kleuren! Thank you very much for your visit on my blog!! You are my 100 follower!!!!! Congratulations for your blog, is very beautiful! Absolutely beautiful! I love the colors and the design! Precioso sofá y preciosa toda la casita de muñecas. Seguiré sus avances y trabajos. Jody, gostei muito do seu blog. Você faz miniaturas lindas! O sofa deste post por exemplo, é maravilhoso. Quero agradecer sua visita ao meu. 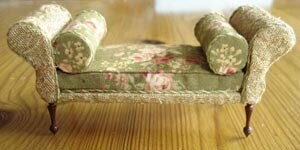 The bench is lovely and the two fabrics go so well together. I also love your bed, it looks reeally old, a beautiful antique, and your coverings and cushions look so inviting. Wat heb je dit prachtig gemaakt ! En ik wens je ook een Gelukkig Nieuwjaar !